DigElogROCORI: The Day All Hell Broke Loose! The fall of 1940 was a warm one. In some ways similar to the fall of 2005. With gardens still yielding vegetables well into October, winter seemed far away. By midday November 11th, some areas of southeast Minnesota topped 60 degrees, but a huge storm was just to the west. Here in the Land of Rocori, the day was one where kids going to school wore little if any jackets. There was no "Doppler Weather Radar" back then. Lots of folks didn't even have radios at home. No one knew what was coming and how fast it would engulf everything in its path. 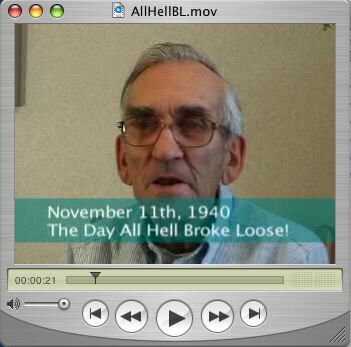 Herb Theis, Cold Spring local historian, tells his version of what took place that day... "The day when all hell broke loose!" "Three storms collided and in a very short time they dumped a whole lot of snow." said Herb. "Hunters up north got snowed in so bad they never made it back." Listen to Herb tell about the two trains that collided in Watkins and how one of the train's whistle continued to blow on into the night until the fire in its steam engine belly finally died out in the blowing ice and snow. This story was sponsored by Affordable Computing Solutions (ACS), your Land Of ROCORI Authorized Clearwire dealer. Contact Ty today at 320.685.3222 or stop by their office at 22nd and 3rd Ave. Suite #4. They are located in the lower level of the Chain of Lakes Mortgage building in Cold Spring. The entry door is around the back. Look for the Affordable Computing Solutions sign above the door. Please call ahead of time for an appointment.